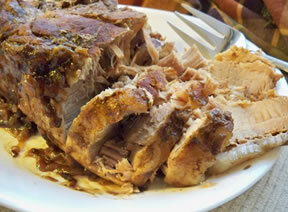 A fantastic way to prepare a pork roast for moist and awesome tasting meat. 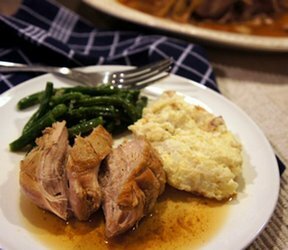 This pork roast is easy to prepare with just a few ingredients. The juices produced from slow cooking the roast also produce delicious gravy. Heat oil in a large skillet. Brown the roast on all sides over medium-high heat. When browned on all sides, place the roast in the slow cooker. Pour the oil out of the pan and then add a little water to deglaze the pan; pour this water into the slow cooker with the roast. Cut the onion into thick slices and separate the slices into rings. Place the rings on top of the roast. Pour the chicken broth in the slow cooker and then sprinkle the top of the roast with the onion mix. Place the cover on the slow cooker and turn it on low; cook for 8 to 9 hours. Remove the roasts and pour grease off from the juices. Pour juices into a saucepan and thicken to make gravy. Serve with mashed potatoes. "Made this slow cooked pork roast this last weekend. It was so simple and the meat turned out perfect. It was so moist and flavorful. I just used a fresh ham roast that we had in the freezer. The juices made excellent gravy too. I made the dumplings and sauerkraut recipe also. It was a great combination."